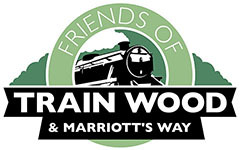 Friends of Train Wood and Marriott’s Way is a group of people working together to make sure Norwich’s most unique historic and natural woodland and riverbank, and off road trail, stays well looked after and open to all, for ever. The wood was formerly under grave threat as Norfolk County Council were seeking to sell it, but our successful campaign made sure it stayed in public hands. We are a group who have come together to protect and enhance this woodland, its rights of way, railway heritage, riverbank and, working with others along the route, the long-distance Marriott’s Way. We are local residents, train heritage enthusiasts, birdwatchers, anglers, cyclists, walkers, commuters, runners, joggers, dog walkers, children, pensioners, tourists, canoeists… we are representatives of the many different groups who care passionately about this amazing place and path. Join us! We are working together to make sure Train Wood stays open to everyone, for ever. Our group is open to all users and we seek to listen to and work with all users of the area. We are working with local authorities and other organisations to improve the Marriott’s Way. As well as regular practical work like litter picks and nature conservation, we have listed Train Wood as an Asset of Community Value with the local authority and made bids for funding. We welcome involvement and new members.